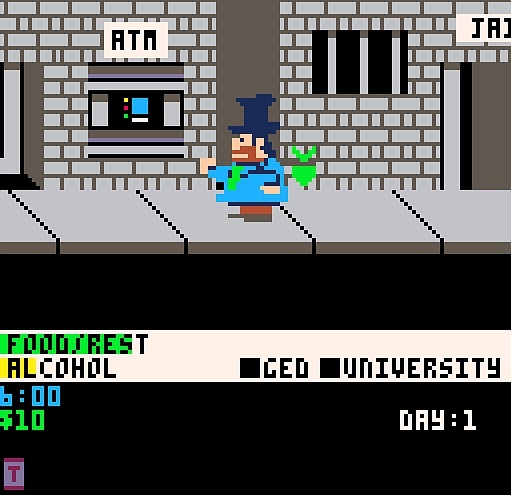 In 1985 Bob Keener with publishing rights by Melody Hall Publishing Corp, released the rather unique adventure game ' Rags to Riches ' on the C64. In the game you played as a tramp that had to make something of himself, by cleaning up the streets of bottles, exchanging them at stores for money, as well as getting a job, a nice hair cut, some education and finally becoming a millionaire by accumulating $1,000,000. Although I've never played it myself, a Pico-8 developer by the name of Greentiger has released the first version of his tribute game on the Pico-8 as ' Skid Row Joe '. 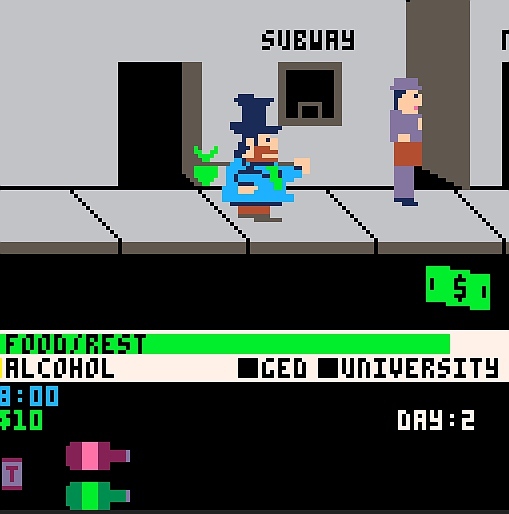 In Greentiger's Pico-8 homage to the C64 version of Rags and Riches, you can certainly see many similarities to that old game, such as having to pick up bottles to be exchanged, the finding of money, having to eat and rest at specific places, and even having to use the subway to get to different parts of the town. In fact if it wasn't for the videos of the C64 version, I would never have known that I had to get a hair cut to stop the Policeman from arresting me for vagrancy, or having to hide in certain shops before the robber takes my money. It's just a shame however that this Pico-8 version doesn't have in game music and the more modern take on the game takes the charm away from the C64 look. But other than that I'm really enjoying it, and I've yet to experience the game to its fullest!